The Frontier is ready to push back. On Stardate 65790.5, a 100-year old probe emerged from the Finnean Convergence Zone in the Gamma Quadrant. Most of the data it contained was corrupted, save for what remained of an emergency beacon. The message it carried was one of danger and warning, delivered by none other than Captain Harvey Geisler. 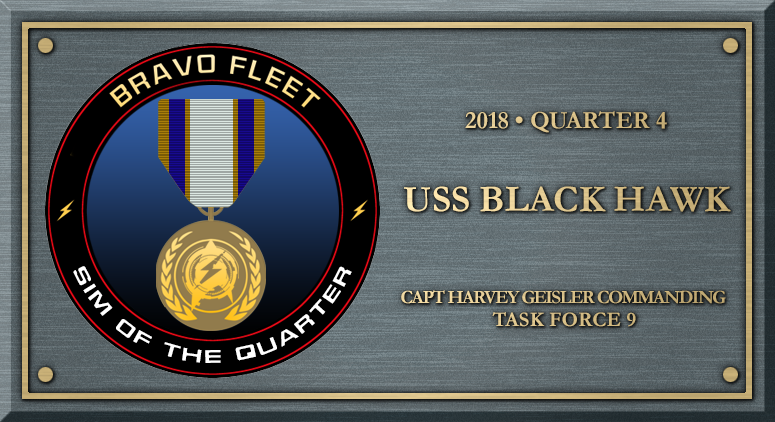 Recalled from Shore Leave in the Alpha Quadrant, Captain Geisler summons the best Starfleet has to offer and takes command of the USS Black Hawk-A. Their destination is the mysterious Finnean Convergence Zone where nothing has ever gone in, and whatever has ever emerged, has not emerged alive. But somewhere, inside the zone, awaits both incredible opportunities for exploration, and perhaps the greatest danger the Federation has ever faced. Can the crew of the USS Black Hawk find this threat before it is too late? -- Have an idea? Contact the GM! Please welcome Ensign Joe Owens, our newest Assistant Chief Engineer! Please welcome back one of the inaugural players of the USS Black Hawk, Lieutenant Landon Milo. He will be rejoining us as the Assistant Chief Medical Officer. Please welcome Lieutenant JG Amanda Bell, an orphaned Vulcan adopted and raised by humans, who will be our Assistant Chief Engineer! Let the emotions begin! Hello, everyone! Bravo Fleet recently announced the recipients of Player and Sim of the Quarter... and we made it! 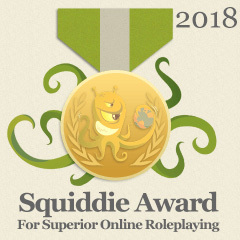 In 2018, we were recognized in the Tournament of Simulations, won a Squddie, awarded Sim of the Month once by Bravo Fleet, and again with the final Sim of the Quarter for the year. Additionally, three of our players, SWO Griffin, Lt. Commander Djinx, and Lt. Di Pasquale were honored with Bravo Fleet's Player of the Month award throughout the year. 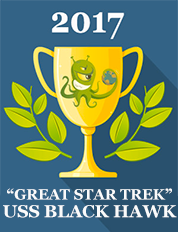 Congratulations to you all for a fantastic year! You can read the official quarterly announcement here.